Bardot Bodycon Scuba Dress is rated 4.7 out of 5 by 12. The bardot bodycon scuba dress is a must-have for your party wardrobe this season. In a curve loving scuba fabric which skims the body and bardot neckline, you will be turning every head in the room. 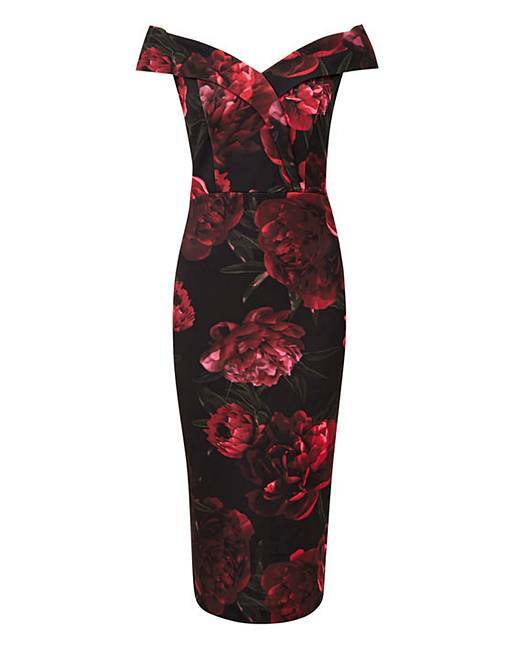 The gorgeous red floral print adds a pop of colour to the dress, so just pair with your favourite strappy heels and some red lippy to complete this chic look! Rated 5 out of 5 by vivienne from Great fit I'm very happy with this dress I bought it for my granddaughters christening. Very comfortable to wear. Rated 5 out of 5 by Minx245 from Lovely dress I was looking for a nice dress for Hogmanay and found this....it was perfect. It was very competitively priced and the quality of material is brilliant. It’s a really comfortable dress to wear and I felt great in it. Rated 5 out of 5 by Jules from Fab dress Ordered for a wedding and absolutely love it. So comfortable to wear and I felt really good in it. Will be worn for lots of occasions. Rated 3 out of 5 by 1964Virgo from Pretty but ... Very pretty dress, but I really didn't like the heavy stretchy material. Reminded me of the nylon things I had as a kid in the early 70s. And whilst it went on very well, I have a bit of a tum and overhang as a result.of surgery and it wasnt flattering even with firm control garments. Would recommend if you dont have much of a tummy, but not if you do.